This article was initially inspired by Vadim's post on mysqlperformanceblog.com comparing MySQL 5.5.4 and XtraDB under TPCC-like workload. Vadim's post has opened an interesting discussion about InnoDB I/O capacity feature in general, and particularly - tunning / settings regarding 5.5.4 and XtraDB. However, going more in depth I've discovered more interesting things than I've expected initially :-) and here is a kind of summary of my observations..
First of all - why I/O capacity in InnoDB?.. Initially InnoDB was designed to flush in background only 100 pages per second. The value of 100 pages was fixed within a code and was not configurable. So, if you have got a storage subsystem able to execute more than 100 writes/sec you were not limited by the storage anymore, but by InnoDB itself..
Supposing you've procured a storage array able easily to execute 1000 random writes/sec, so how you can improve your performance now?.. Now, with a new storage you're able to say you can keep 1000 writes/sec, and set innodb_io_capacity=1000. What it'll change? - on the time of the Google patch this value was mainly used to size dirty pages flushing. So every time InnoDB reached the max dirty page percentage setting it started a flush batch with a number of pages equal to IO capacity setting (as well in other background flushes too but with a much smaller impact).. If you're flushing too much you'll make your storage busier and your overall performance lower..
All changes are reflected in the redo log, so in case of crash you should recover them (but well, if you're crashing too often you probably need to change your HW or OS vendor ;-)) But supposing you've got a solid HW, stable OS, huge RAM, fast storage and don't afraid to drive fast :-) So where is a real danger?.. As you have, say, 16GB of RAM on machine, it'll be pity to use only 500M for your buffer pool :-) And once you'll configure buffer pool=12000M you'll see a huge performance improvement, but mainly on read operations.. - On the Read+Write workloads you'll only go faster due faster cached reads, but writes will not go faster.. - Why? - you'll be still limited by the size of your redo log :-) 128M is too short and you'll be constantly doing a full flush.. BUT - there are huge periodic drops.. And the origin of these drops is out of space in redo logs. Can it be fixed and how easily ?.. You may lower your max dirty page percentage setting and force InnoDB to flush the modified pages before the redo logs will be out of space, and IO capacity setting will help you here to adapt your I/O activity according your workload. BUT - the problem is that there is no direct dependency between a number of dirty pages and a number of records in redo logs!.. - So your setting may be still be not low enough to cover any kind of activity, then by setting max dirty pages percentage too low you're starting to write too often and slow down your general performance.. The first real solution for this problem was proposed by Percona team by introducing Adaptive Checkpoint feature. 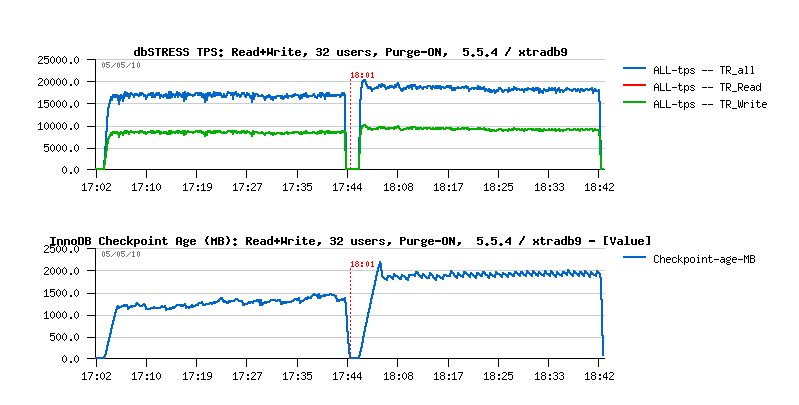 The initial implementation of Adaptive Checkpoint was released as progressive flushing: depending on the percentage of redo log occupancy, the dirty pages flushing was adapted with a relative IO capacity percentage - less free space is left in redo logs, higher percentage of IO capacity is used for dirty pages flushing. This solution is still integrated within Percona's XtraDB and called "reflex". InnoDB then introduced a similar feature which is called Adaptive Flushing. The solution is based on calculation of estimated speed of necessary flushing according the dirty pages level and redo log space occupancy. The estimation obtains finally a number of pages to flush and this number is compared to the IO capacity setting: the lower of two values is used then. Then, if your workload become really heavy on writes, you'll need a Purge Thread (otherwise either Adaptive Checkpoint or Flushing will not be able to help you because their code will be never reached, so never executed.. - I'll skip details here, but if you want to know why you may read this post ). Just keep in mind that you may need a Purge Thread feature to be sure all things are working right. So by tuning the IO capacity setting according your workload you may adapt I/O activity on your systems: more or less aggressive writes will be involved on your storage subsystem. As well it's also very useful when your goal is to run several MySQL servers in parallel on the same host (for virtualization or other reasons) and you expect to guaranty a reasonable storage sharing between your MySQL instances. By IO capacity setting you may attribute a sort of quotas for each MySQL server on write activity, etc. On the same workload and similar my.conf settings MySQL 5.5.4 performed less stable comparing to XtraDB..
Further investigations showed that 5.5.4 become more stable with a higher innodb IO capacity setting (and a bigger buffer pool as well).. So it means that Adaptive Flushing estimation obtains a higher number of pages to flush comparing to the initially used IO capacity setting... So if the IO capacity is configured lower than it should be for a given workload then InnoDB will not flush fast enough to keep a room of free space in the redo logs and will meet a "furious flushing" every time..
To understand if your IO capacity settings is good enough you may just monitor your checkpoint age over a time: if it remains low, stable and not increasing to reach the critical level (ex: stays under 80% of your redo space MB) - it's ok. Otherwise you should increase your IO capacity value. A counter of "furious flushing" events (e.g. every time when the full flush is involved due missing free space in redo logs) - it'll simplify InnoDB monitoring and give you a needed information about full flushes without needing to monitor checkpoint age..
Print a current estimated IO capacity value within InnoDB status output to see if there are gaps between estimated and configured IO capacity values.. Seems it'll be easy to add. Well, if it became less or more clear with IO capacity impact, there were still several questions regarding MySQL 5.5.4 which did not stop to run in my head and needed to find their answers..
Having 17.000 TPS and 18.000 TPS makes an important difference, specially that having only one purge thread is not yet removing completely a purge lag, and you may need to run two purge threads or have a purge lag fix applied to reach a real stability, but this will also reduce your performance little bit because purging has a big cost! (Ref. : MySQL Performance: Improving Stability for more details).. Initially I've started to trace estimation values reported by InnoDB Adaptive Flushing - and it's true, sometimes they were looking too high or too low.. So, I've replaced estimation function by my own formula similar that I've used in 5.4 tests - and it was possible to make InnoDB performing better with a such simple formula, but it make me worry on the same time that such a tunning will be very workload oriented rather universal..
And then if I monitor my redo log write activity I have only 10-12MB/sec on write activity, which is giving me on x3 of 1GB logs at least 200 sec before there will be no free space in my redo logs! So what I'm doing wrong during these 200 sec to arrive into a bad situation when I don't have a free space anymore?.. Initially it was buf_flush_batch() function, and since 5.5.4 it's buf_flush_list() function which has only 2 arguments: number of pages to flush and the max age of pages to flush.. So the Flush Age is always adjusted according the avg redo log activity observed over a time; then the IO capacity settings is limiting the number of pages to flush in case there are too much corresponding to the given age limit..
Optionally, the IO capacity setting is increased by +100 every time when there was met 10 times the redo log occupancy at 75%..
As you see, limiting Purge Lag to 400K is reducing performance (as expected): from ~18.000 TPS we're going to 17.000-17.500 TPS.. However there is a huge changes on the History List length - if before after 40min of activity it grew up to 10M(!! ), then now it remains stable at 400K, which is way better for production environment and general workload stability as well..
Don't know if I'm right, but it looks like there are several bugs/improvements to fix/make here..
Then - the user activity within a Master thread is verified via srv_activity_count variable, and seems in some cases it remains not increased (or probably my changes involved such a situation), so by increasing its value inside of the 1sec loop if there were changes in redo log fixed the problem! There is still possible that even well tuned IO capacity configuration may meet cases when the IO capacity setting may be lower than needed.. And as I said, it should be configurable and up to user decision if writes should be free of limit or not.. In my case I've tested an auto adaptive IO capacity which is incremented progressively every time the redo log free space become close to critical levels..